If you're anything like me, the excitement of discovering your new thrifting hobby can be a bit overwhelming. So overwhelming, that you may just feel like you need to buy every piece of cute clothing that you see because the deals are just that good. Now a little over 5 years later, your closet is overflowing with things that you've neve worn or maybe even forgot that you picked up. Okay, this could all be just me...but having so many awesome potential wardrobe pieces right at your fingertips for that cheap can easily ruin all of your best judgement! 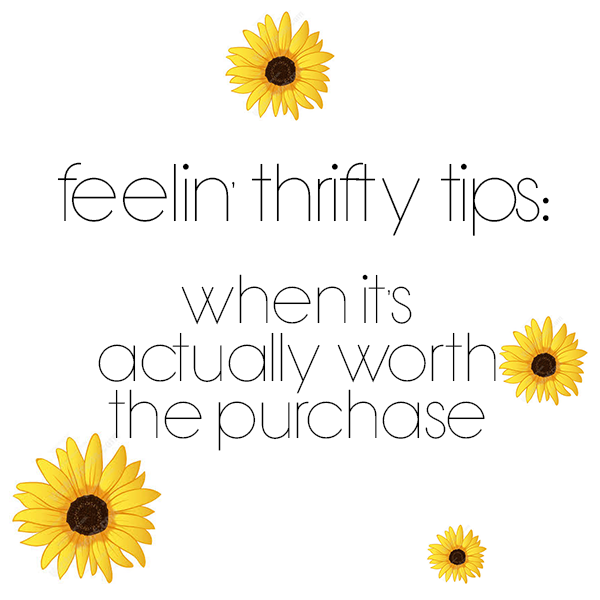 In this week's Feelin' Thrifty Tip, we're going to talk about when it's actually worth the purchase! 1. You don't have anything in your wardrobe exactly like it. As a thrifter, it may be difficult to find two identical items..but you'll definitely see some things that are super similar. It's not necessary to own 4 different pink blazers just because the buttons on each one are different. Thrifting can definitely leave your wardrobe with a bunch of unnecessary look a likes. If the pieces don't have a significant difference, don't buy it! 2. It fits comfortably. When you're surrounded by clothing items that are typically all $5 and less...it can be easier to talk yourself into purchasing something even though it doesn't quite fit. "Oh, I'll work out a little more and lose a couple inches and then I'll be able to wear this soon enough." Don't do it guys. You'll just throw it in the back of your closet and never think about it again. If you purchase something too big with plans on altering it to fit, try to make sure that you do it within the same week. It can be so easy to push those projects to the side and never get around to it. 3. It matches your style. Though that neon colored polka dot blazer may have caught your eye, does it really match your style? Before purchasing something super different from the thrift store, take a second to think about how you would possibly style it with your current wardrobe. If it will involve you buying new bottoms, shoes and accessories to ever make it work, it's most likely not worth it....even if it is only $2.99. As a thrifter, it is so important to know how to tell the difference between when a piece worth buying and when you're simply intrigued by the extremely low price tag. As long as you have this skill down pact, you'll have a beautiful curated thrifted wardrobe in no time!